BEFORE READING PLEASE CLICK HERE TO READ AN OUTLINE OF DANIEL. BEFORE READING PLEASE CLICK HERE FOR A MAP OF THE BABYLONIAN EMPIRE. BEFORE READING PLEASE CLICK HERE FOR A MAP OF THE PERSIAN EMPIRE IN 500 B.C. BEFORE READING PLEASE CLICK HERE FOR A MAP OF GREECE DIVIDED AFTER ALEXANDER DIED. BEFORE READING PLEASE CLICK HERE TO READ ABOUT ISRAEL'S HISTORY. BEFORE READING PLEASE CLICK HERE FOR A LIST OF ISRAEL'S KINGS AND PROPHETS. BEFORE READING PLEASE CLICK HERE TO VIEW OLD TESTAMENT BOOKS TIMELINE. BEFORE READING PLEASE CLICK HERE FOR A LIST OF MAJOR EVENTS FROM DANIEL'S TIME TO ROMAN TIMES. Before analyzing the test of any book of the Bible, it is well to learn the historical background. Also, it is best to make a "skyscraper" view of its general contents. Accordingly, this introduction is divided into two parts: background and survey. Author: Daniel. 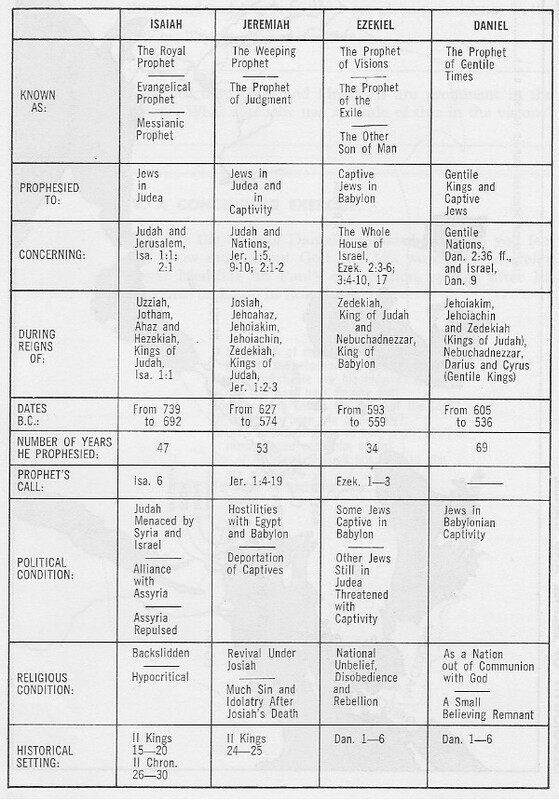 Some claim that Daniel did not write the visions as stated in the time section above. As stated there, there is not proof of this claim. In 605 B.C. the Babylonians from the north attacked and defeated Egypt. (2 Kings 24:1-7) Judah then became a colonial state of Babylon Empire but was permitted to keep its own national, spiritual, and cultural identity. In 597 B.C. Jehoiakim, the son of Josiah, the kings of Judah rebelled against Babylon. Nebuchadnezzar, the king of Babylon, miserably defeated Jehoiakim. Because of this rebellion Nebuchadnezzar completely destroyed Jerusalem, Judah's capital, as well as many other major cities. In his time Daniel was famous for his wisdom throughout the world. (Ezekiel 28:3) Before his captivity he was trained in Jewish culture and the Bible (as it was then). At the beginning of his captivity he was trained in the best university in Babylon the world power. Daniel position was a counselor to the king. He worked in the courts and councils of some of the greatest monarchy the world had; Nebuchadnezzar, Cyrus, and Darius. Daniel wrote the first chapter in the Hebrew language. Chapters 2 thru 7 were written in Aramaic, the then common commerce language used throughout the Gentile nations. Chapters 8 thru 12 are written in Hebrew. Daniel was deliberate in writting in these two languages. The Hebrew chapters are about Israel's future (not just Judah), future from Daniel's point of view. The Aramaic chapters are about the Gentiles' future from Daniel's point of view. Jesus called it the time of the Gentiles. (Luke 21:24) Most of the events predicted in this book are history to us. The godless kingdoms referred to are the Gentile nations, and the kingdom of God are those who will partake in the millennial reign of Jesus (Yeshua) Christ (Messiah) centered about Jerusalem and Israel. Many of Jesus' parables explain about the kingdom of God.